Enjoying food doesn't necessarily mean that you should over eat; on the contrary you're over eating because you're not enjoying your food. Why you cannot enjoy your food? Because food is condemned, condemned for persuading us to eat more and gain weight. You cannot enjoy the food deeply; rather you're guilty about the muffins you eat. It looks like a swirling circle, it is. If you can enjoy 10% bites of your food, you'll feel colossal fulfillment and surprisingly you'll be taking less. At least your excess eating will dramatically shed away. 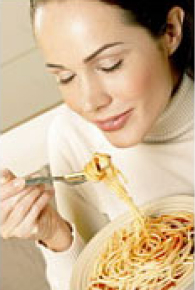 Hypnosis will simply help you break the old eating habits, habit of eating in high speed. We eat in such high speed, as if we have to catch a flight and sometimes we have to. This resistance will not allow you to enjoy your food, it will again and again take you to the old eating habits, where you'll be eating more and enjoying less. Yes you can apply the principal "enjoying your food" without hypnosis, but we have already fair amount of complications in our life, it would not be wise to fight with an old habit. How hypnosis can change your eating habits? With hypnosis we can suggest our body to enjoy 10%-20% of the bites and chew them well. And the more you're satisfied with the food, the less you'll need it. If you would like to learn more about weight loss hypnosis, please subscribe to the below list with your comments. At the moment I don't have a weight loss hypnosis product, but subscribing to this list will keep you updated about it.